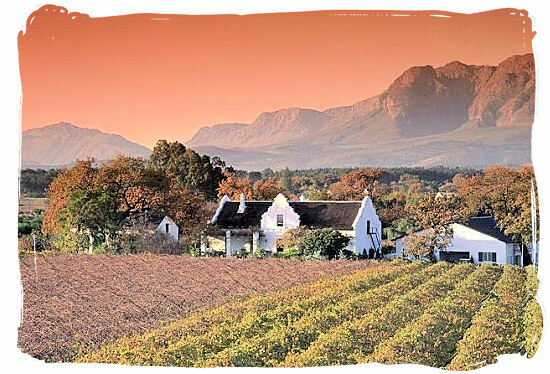 The world renowned Cape Town South Africa wine country also known as the Cape Winelands, isthe largest wine producing region in South Africa. Situated in the south-west corner of the Western Cape province and only a 45 minutes drive from Cape Town, it is divided into six main regions, Franschhoek, Stellenbosch, Constantia, Paarl, Wellington and Robertson. The Cape Winelands have a become major tourist attraction in South Africa, offering a large variety of stunning and greatly enjoyable wine routes. 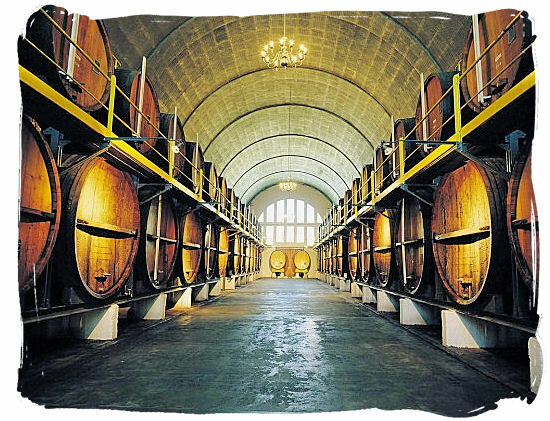 The wine making culture in South Africa is as old as the recorded history of the country itself. It was Jan van Riebeeck who produced the earliest recorded wine in South Africa in February 1659. 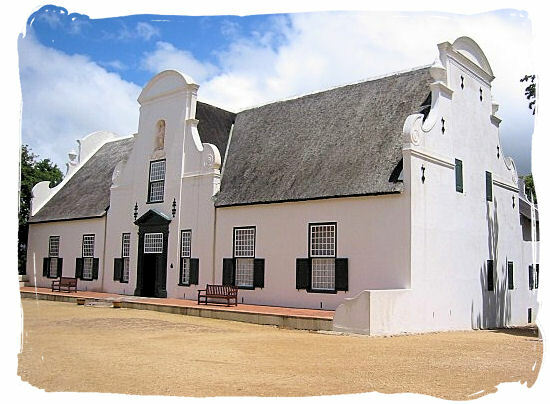 One of the most famous and oldest wine farms in the area is "Groot Constantia", established by Simon van der Stel, first governor of the Cape Colony in 1685. Situated on the Southern Slopes of Table Mountain it is still world-renowned for its excellent wines. Sophisticated wine making and the dark African continent is for many refined European and American wine drinkers an almost unthinkable concept. And yet there are vineyards to be found in many regions on the African continent. Morocco and Algeria for example are countries that have been producing wines for dozens of years. And countries like Kenya and Zimbabwe have also started up modern wine-making ventures, which may surprise the wine-drinking world with all kinds of exciting new flavour experiences. But it is in the South Africa wine country down in the south-west region of the Western Cape province, where topographic and climactic conditions were surprisingly similar to those in the classic wine countries, where the African continent's greatest wines are produced. With the "Old World" wine cultures of France, Italy and Germany at its cradle 350 years ago, the Cape's wine culture measures up to the best in the world. Its top wines shine with confidence amid the world's best, while the "easy-drinking" category is second to none. Next to its fame as one of the top tourist attractions in terms of its rich cultural heritage and world-renowned wines, the South Africa wine country region or Cape Winelands as it is most often called, is also widely acclaimed for its natural beauty of stunning panoramas of sweeping vineyards and soft rolling hills hemmed in between majestic mountain ranges. 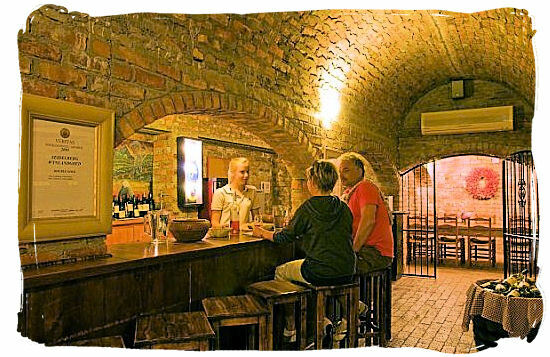 Not to mention the great food that goes with the wine tasting and the cultural heritage on show at the wine farms and the Art and Craft markets in the small and historical villages. 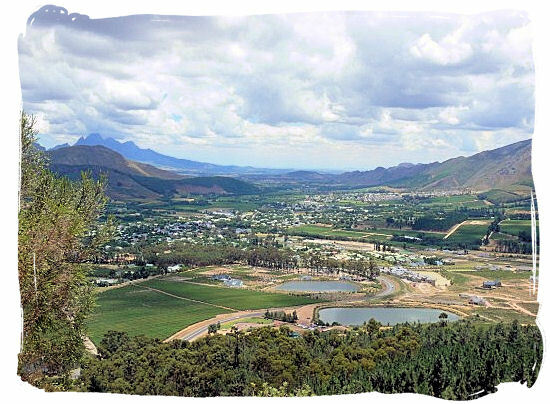 It is only a 40-minute drive from Cape Town to Stellenbosch, which lies in the heart of the Winelands region. Vergelegen, Hamilton-Russell Vineyards, Kanonkop Estate, Klein Constantia, Boekenhoutskloof, Glen Carlou Vineyards, Rustenberg Wines, Thelema Mountain Vineyards, Neil Ellis Wines, Bouchard Finlayson, Graham Beck Wineries and Springfield Estate, Buitenverwachting Estate, Jordan Vineyards, Spice Route Wine Company, Villiera Wines, De Trafford Wines, Veenwouden, Fairview, Saxenburg and Grangehurst.